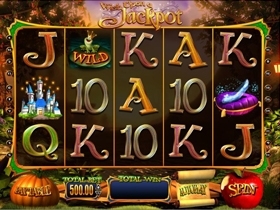 Slot Games listed are Wonder Woman Slot and Wish Upon A Jackpot Slot. Based on the Superhero series from DC Comics this 5 reel 50 pay line video slot from Cryptologic is highly popular and includes two Jackpots, both non progressive. There is a good spread of acceptable coin values from $0.01 to $20.00. You can insert up to 60 coins, allowing you to bet up to $1200. The Wild is Wonder Woman herself and the Scatter is the Indestructible Bracelet. Other icons from the Superhero series include the Invisible Plane, the God Ares and Zara. The Scatter symbol activates the Bonus Bet and you can help the Amazon princess battle her way through an island full of zombies in the Special Feature that ends with an incredible battle between Wonder Woman and the God Ares. 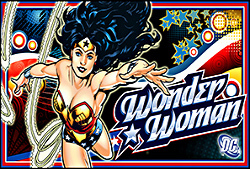 Watch Wonder Woman use her Magic Lasso to create Wild symbols during the Wonder Wilds Free Spins Feature; Wild symbols are held on the reels for up to 5 spins! The animation from Cryptologic is excellent and with some good cash prizes Wonder Woman is certainly worth a play – give it a try you will enjoy!